Today's Denver Post ran a piece by David Brooks from the New York Times under the heading "Our poor, broken society: two revolutions damaged community." I found myself nodding in agreement all the way through. The broad thesis is based on the work of one Phillip Blond, a British writer. Brooks writes, "Blond argues that over the past generation we have witnessed two revolutions, both of which liberated the individual and decimated local associations.... First, there was a revolution from the left: a cultural revolution that displaced traditional manners and mores; a legal revolution that emphasized individual rights instead of responsibilities; a welfare revolution in which social workers displaced mutual aide societies and self-organized associations. Then there was the market revolution from the right. In the age of de-regulation, giant chains like Wal-Mart decimated local shop owners. Global financial markets took over small banks, so that the local knowledge of a town banker was replaced by a manic herd of traders thousands of miles away. Unions withered. The two revolutions talked the language of individual freedom, but they perversely ended up creating greater centralization." That's a beautiful job of reframing the long conflict between left and right to the essential dilemma. To put it in "Fourth Turning" language, our time is about the primacy of individual values over institutional values - to the destruction of both. In my book, that's what I called the New Inquisition. Just for the record, I am neither liberal nor conservative. I believe in life, liberty, and the pursuit of happiness. When we get to specifics, I make up my mind based on the evidence and my own thinking. Often enough, I find both political parties simplistic and pointlessly combative. For the twenty years of my career in Douglas County, I have focused on the community level. I'm not a shill for the state, or the Feds. Library funding comes almost entirely from the people who live in the very same county I live in. The focus of that career has been to serve those people well, focusing on local needs and resources. And that seems to be Blond's recommendation for the future: "reduce the power of senior government officials and widen the discretion of front-line civil servants, the people actually working in neighborhoods. He would decentralize power, giving more budget authority to the smallest units of government." This is the philosophy once known as "communitarianism," which I still find more thoughtful and sustainable than most alternatives. At any rate, I like the Brooks column a lot. Recommended. 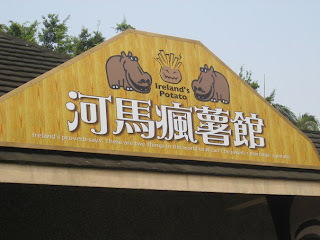 "Ireland's proverb says: There are two things in the world that can't be joked: 1.marriage 2.potato"
How true that is. A wise people, the Irish. Step 1: Hang the speed-conteroller on the frame and fasten. Step 2: Make sure nobody outside the window , release the belt reel. Step 3: Encircle the belt to both armpits, the spring belt in one armpit, pull the rope (long side) to the end. Step 4: Grip both belt and rope,climb out of the window, Facce to wall, loosen the rope and descend. Step 5: During descending with arms downward clamping the rope. And keen hands against the wall for balance. Step 6: Before landing, bend knees to decrease the shock. Note: as landed, loosen the buckle, quikly take off the belt for next person to use. The hotel room is very clean and well designed, albeit with a couple of things that baffled me at first. For instance, there are light switches that don't work. Why? Because you have to put your RFID room key in a special container on the wall. Then everything DOES work. And you also know where your key is. Beyond that, the staff are wonderful, friendly, efficient, and speak enough English to conduct necessary transactions. Breakfast is delivered to your door from next door's McDonald's -- you fill out your request when you check in at night. Where there would be an ice machine in an American hotel, there's a boiling hot water dispenser by the elevator. My room has a little tea pot with packets of green or oolong tea. And of course, there's free wifi, and a very newish looking flat screen monitor. The prices - for everything, so far - are just unbelievably low. $50 American per night for the hotel. The public transit is fast, sparkling clean, and works out to something like a $1.50 a ride. Last night my son and I took my daughter and a couple of her friends for a wonderful Indian meal. That would be 5 people. The cost was around $50. I don't know why I haven't heard of more people visiting here. A fascinating place. Highly recommended. Jamie Larue interviews Jamie Larue from Douglas County Government on Vimeo. As noted in an earlier post, Douglas County took down the Authors @ DCL site. They seem to be transferring some of them, like this new one, over to Vimeo. I still think the technical stuff to make this work is amazing. Just saw this today. Click the entry title to get the video. "Fresh from the week off, Jon Stewart jumped right in Monday night and took on one of his favorite targets, Glenn Beck, who used his appearance at CPAC as a chance to alert the crowd of the dangers of Progressivism. "At the conference, Beck compared Progressivism to Communism, and cited previous progressives such as Woodrow Wilson and FDR, who pushed for the income tax and universal health care, respectively. Despite the former being used by elected officials to create things for the common good, Beck stressed that these were the first steps on the road to ruin. 'Glenn, the library isn't free! It's paid for with tax money. Free public libraries are the result of the Progressive movement to communally share books. The first public library was the Boston public library in 1854. It's statement of purpose: every citizen has the right to access community owned resources. Community owned? That sounds just like communist. You're a communist!'" Good to have cleared that up.